he Sari is 6 yards of fabric which when drpaed in a particular manner gives rise to an attire that is complete in every aspect. Draping a sari ia an art. The sari is worn in different styles in various parts of India. However, the most common method involves wrapping the sari around ones waist, making pleates in front and drpaing the final length over the left shoulder. This remaining fabric, drpaed over the blouse and the left shoulder , falling behind one’s boby is called the Pallu. Start with inner edge (least patterned plain end) of the sari, with sari fall (lined border) falling along the inside of the bottom edge. Tuck the inner edge into the waistband of the petticoat, slightly to the right side, with the rest of the sari wrapped round to the left. The amount you tuck-in depends on your height and how long you want the sari to fall. TIP- You might want to put on your footwear before you start draping the sari, to achieve the right length. The sari should almost fully cover the heel. Take the remaining fabric around the body and measure the length of the Pallu, approx. 1 metre (the extensively patterned end of the sari that will finally fall over the left shoulder behind the body). Pallu is the other end of the sari from the end you have tucked in. Take the partially pleated pallu measured (approx. 1 metre) behind you from the left and forward again from your right. Place the pallu over the left shoulder and let the 1 metre length fall behind you. 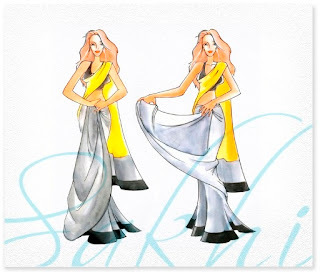 Create pleats with the sari fabric remaining undone in the front. Make about 5 to 7 pleats of 6 inch each and hold them up together so that they fall straight and even. The pleats must face left. Tuck the pleats into the waistband i.e petticoat, slightly to the right of the navel, taking care to see that the pleats are tunred towards the left. Use a special sari pin to secure the pleats. TIP- Ensure the pleats are pinned to the petticoat underneath for addiotnal support. This will ensure the sari stays in place. The pallu of the sari can now be arranged to suit your own style. 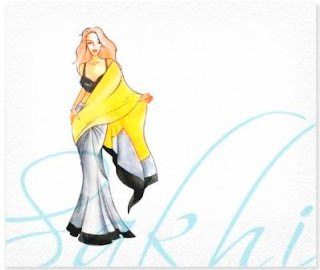 The style most commonly followed is flinging the pallu over the left shoulder, or pleating and pinning it to the left shoulder, so that the pallu can swing open at the back. Any excess fabric on the back or sides can be tucked inside and secured with a safety pin. Viola ! The draping is complete. The sari can be made to look modern or traditional based on your choice of accessories. To go trendy, choose a blod watch, chunky bold beads for the neck and hand, and complete the look with a chic clutch to match. 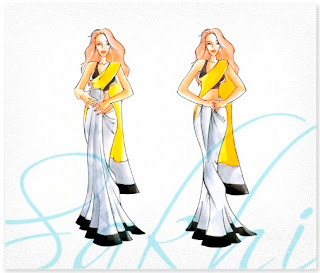 © Sakhi Enterprise and Sakhifashions, 2009. Unauthorized use and/or duplication of this material without express and written permission from this blog’s author and/or owner is strictly prohibited. 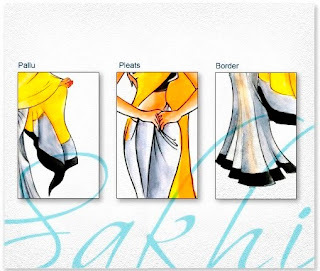 Excerpts and links may be used, provided that full and clear credit is given to Sakhi Enterprise and Sakhifashions with appropriate and specific direction to the original content.